Equine product sales representatives market a variety of horse-related products to retailers. Equine product sales representatives, also known as manufacturers’ representatives, are responsible for marketing products such as horse feed, supplements, saddlery, trailers, grooming equipment, and accessories. Product sales representatives are supervised by sales managers, who oversee their efforts to place products in retail locations. There are two types of sales representative positions: inside sales and field (outside) sales. Inside sales positions involve contacting potential customers over the phone, primarily in an office-based setting. Field sales positions involve traveling throughout a designated territory, visiting retail locations in person to sell products or to provide training related to specific product lines. Field sales representatives also may give lectures and demonstrations to highlight the best attributes of the product and display their varied uses. These demonstrations are often presented at equine industry trade shows, conventions, trade shows, horse shows, tack shops, or retail store locations. They may also drop off items for customers to test out (i.e. 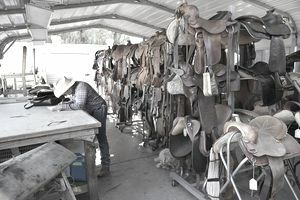 saddles or other tack). Computer skills are very important for sales professionals, as they must carefully monitor their promotional activities and sales volume to meet or exceed the quotas set by sales managers. Equine product sales representatives can specialize in selling products to a particular type of vendor or presenting items at trade shows and industry events. Specialization by product and brand is common. Sales reps may represent a particular line of saddles, specialty horse feeds, or hoof treatments, for example. If they are successful, product sales representatives may have the chance to move up into a sales manager position and supervise a team of reps. Sales managers also provide training and support for their sales team. Equine product sales representatives can also choose to transition to the pet product sales or veterinary pharmaceutical sales arenas, as the required skills are readily transferable. Most equine product sales representatives have (at minimum) a Bachelor’s degree in a field related to animal science, business, or marketing. Those with graduate degrees or extensive practical experience in the field tend to have the best opportunities. An equine product sales representative should have a thorough knowledge of the equine industry, strong public speaking skills, and a knack for persuasion. Most new recruits must complete a training course with their employer before interacting with clients. There are a number of certification options for those working in sales. One highly regarded certification program is offered through the Manufacturers Representatives Education Research Foundation (MRERF). The MRERF offers certification as a Certified Professional Manufacturer’s Representative (CPMR) or as a Certified Sales Professional (CSP). The American Pet Products Manufacturer’s Association (APPMA) is the most prominent membership group for pet product sales representatives, and some equine reps are members as well. The trade association conducts market research studies, puts on educational events, and hosts the Global Pet Expo each year. Another well-known membership group is the Manufacturers’ Agents National Association, which offers continuing education classes, networking events for manufacturers’ agents (including those in the equine industry), and research on the sales industry as a whole. While not specifically focused on equine product sales professionals, this group offers useful sales support. Compensation for equine product sales representatives usually is based on commission and salary. Most product reps are also eligible to receive bonuses when they achieve certain sales milestones. Equine product sales representatives generally earn more than $50,000 per year. Indeed.com reports the salary of pet product sales representatives averages about $79,000 per year. While the Bureau of Labor Statistics (BLS) does not separate out equine or pet product reps in their salary survey, they are included in the more general category of all sales representatives. According to the BLS, the lowest ten percent of sales reps earned less than $37,430 per year and the highest ten percent earned more than $149,010 per year. Field sales representatives often receive additional compensation and benefits which may include use of a company vehicle, paid travel expenses, and an expense account for entertaining clients and other incidentals. According to the BLS, sales representative job opportunities are expected to only grow about as fast as the average for all careers, at a rate of about 7 percent, so competition should remain fairly steady for these positions from 2014 to 2024. The equine product industry has been showing growth over the past several years, so it is probable that equine sales positions will continue to expand to meet this demand.